Buick began production of this mid-range personal luxury car in 1973 to complete its lineup. 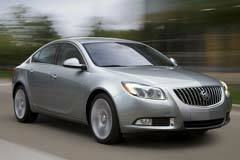 Used Buick Regal cars from the first generation are now featured as classic cars. The first generation had two body styles. It was available as a 2-door coupe or a 4-door sedan. In terms of engine options, there was a 3.8L V6, a 5.7L V8 and a 7.5L V8. All versions had 3-speed automatic transmissions. Later generations introduced hybrid models as well. The exterior of the car changed significantly over the span of multiple generations. Buick’s first line of the Regal car was featured as a slick long body vehicle. Later on, the front grille increased in size, air vents were added and more fluent lines changed the aerodynamics of the car. Looking at the interior, the Regal line always featured cloth and leather seats, high quality materials and ergonomic design of gauges and instruments.